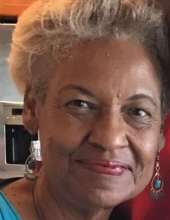 Mrs. Patricia Laster, age 69, departed this life on Saturday, January 19, 2019 at Shands Hospital in Gainesville, Florida. Patricia was born March 5, 1949 in Westerly, RI to the parents of Grant and Pearl (Nelson) Ralls. She was the youngest of 10 children. Patricia attended Westerly High School. She was employed by the City of New London, CT. After moving to Maryland, she attended U.S. Department of Agriculture Graduate School and became employed by the Department of Agriculture as a Computer Specialist. There she wrote numerous programs which some are still being used today. She retired after 30 years and decided to migrate to Ocala, Florida with her husband in November 2016. Patricia married Edward Laster March 1978 and together raised five children. Patricia and Edward were happily married 40 plus years and enjoyed each other’s company from the time they laid eyes on each other. Patricia was a member of Shiloh Baptist Church in Landover, MD, for many years. After moving to Ocala, Florida, her and her husband Edward joined Mt. Calvary Missionary Baptist Church where she remained until her death. Patricia loved spending time with family especially her grandchildren. She loved to travel, decorating and going to estate sales. Her favorite store was Home Goods. Patricia was very active in the Senior’s Ministry and making church programs and bulletins. She loved helping others and found great pleasure in the opportunity to feed the less fortunate or just to lend a helping hand. She leaves to cherish her memory, her husband Edward L. Laster, Ocala, FL, her three daughters; Lisa Gaston- Washington, D.C.; Danielle Holland (Tevon) – Upper Marlboro, M.D., Tiffany Laster – Fort Myers, FL; three siblings; David Ralls, Florence Lewis and Ellen Connors, five grandsons: Christian and Bryce Holland, Maurice and Malakai Joyner and Gregory Brown; granddaughter: Nicole Brown; three great grands and numerous nieces, nephews, cousins and friends. And also her favorite church singer Stephon Gillings, who she thought of as her godson. She is preceded in death by two sons, Michael and William Brown from a previous marriage: three sisters and four brothers. Patricia will be deeply missed by her family, friends and all who knew her. To send flowers or a remembrance gift to the family of Patricia Laster, please visit our Tribute Store. "Email Address" would like to share the life celebration of Patricia Laster. Click on the "link" to go to share a favorite memory or leave a condolence message for the family.